I am not impressed with the advice I have found on the internet for investing in TSP funds. I really don’t think it is that difficult to do the basic analysis, but I just do not see it anywhere. Sure, I see the market technicians. And I often see options for long term investors like the aggressive allocation, the moderate allocation and the safe allocation. If you see this, run don’t walk. These options are what most investors get even from financial advisers. The assumption is you have to take more risk to get higher returns – you don’t. The other assumption is usually that small cap stocks come with more risk so the aggressive allocation would have more TSP S fund and definitely no TSP G fund. Maybe worse than financial advisers are the services for market traders that have you move in and out of the market 20 times a year. If you like losing your shirt to the rich guys with their ultra-high speed computers plugged directly into the stock exchanges, go for it. This is not investing, it is not even speculating since the casinos never lose in the long run. I know a lot of investors just wag it and go with something like 33/33/33 between the three stock funds. 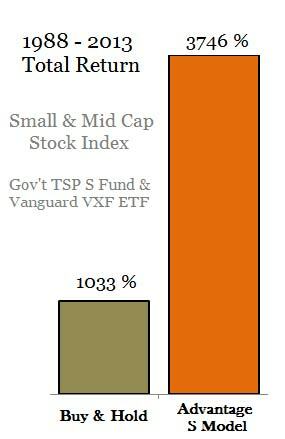 And many wonder why would you ever invest in the TSP G fund with such a low returns…even the TSP F fund past returns beat the TSP G fund, right? Unfortunately they do not teach investing in high school or college (unless you are a finance major), so it is understandable that most people go looking for help. The problem is a lot of those financial advisers don’t have a finance degree either. Many advisers get training from their company and the training process is on marketing not the markets. So if you really want to know what the best TSP allocation is for 2018, I am going to make you sit through a bit of very basic analysis to understand why a 33/33/33 (or 50/50 in the C/S fund) is not a good idea or why the TSP F fund’s future returns are not going to beat the TSP G fund in 2018. But what I really hope to debunk is the notion that you have to take more risk to increase your returns. You don’t have to sign up for anything to start improving your allocation decisions. Just a little reading about the TSP funds after starting with a better understanding of who I am and why I started this blog. If this interests you, please view the Best TSP Allocation.